Hot tub and swim spa product specialist Aqua Spa Supplies will be promoting the fact that it is helping its growing legion of dealers to capitalise on increasing demand during the forthcoming Hot Tub Living Expo. The Chelmsford-based company, which is part of the Aqua Warehouse Group that distributes the L.A Spas and Vita Spa ranges of hot tubs and swim spas, has fitted a new mezzanine floor to boost capacity at its warehouse that has taken on the exclusive supply of the USA-manufactured End2End swim spa cover to the British market. Aqua Spa Supplies Warehouse Manager John Mabey has been helping to promote the new End2End product line that was launched to its growing stable of swim spa covers for the 2016 expansion of the ever-increasing range, which includes the fully-automated Covana Legend CS 1000 cover system. 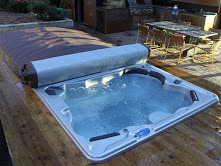 The End2End system, pictured, has already had a significant impact in the market after it made its debut at the fourth edition of the UK Pool & Spa Expo, which has now been renamed the Hot Tub Living Expo, and was also showcased to the British wet leisure trade audience during the 20th anniversary edition of SPATEX. John has reported that the swim spa system has generated a considerable amount of interest after the Aqua Spa Supplies team highlighted how easy it is to retract an End2End cover during the two UK wet leisure exhibitions. The rugged USA-manufactured covers have steel frames fitted into their thick and durable covers; which are light-weight and flexible enough to enable one person to easily roll it off partially or fully and are custom-built for swim spas up to 20ft. Along with a blossoming cover range of covers including the automated Oasis and Evolution options from Covana, and the WhatSpa? favourite hot product the Spa Bar, John and the Aqua Spa Supplies team are currently promoting a wide range of hot tub and swim spa cleaning products to the trade including the Ultra Mitt, Mytee Mitt and Life Spa Brush, plus the Pool Blaster Aqua Broom, Shake-a-Vac and the Aerospace 303 Vinyl Cleaner treatments to repel dirt, oils, dust and other mildew-loving contaminates. The Aqua Spa Supplies team is also looking to provide dealers with the sweet smell of sales success with a thriving selection of fragrances from the Spazazz Crystals range of options including the fruity choices of Grapefruit Organge and Kiwi Pear in the Spazazz Escape category. An innovative Underwater Light Show and Starship product that is promoted as a floating disco ball for pools is also being provided to dealers this year but John revealed that the Grip O Cooler is still one of the hottest products at the top of the sales charts. Designed to keep Champagne and wine bottles cool, as well as up to four glasses secure, the Grip-O Cooler is a large bottle holder and insulator with eight suction feet. These are designed to stick to smooth surfaces such as fibreglass gelcoat, hot tubs, plexiglass, glass, metal or any smooth non-porous surface. To help meet the growing demand from the wet leisure trade the Aqua Spa Supplies warehouse has had its new mezzanine floor fitted to accommodate larger levels of stock, which includes a large selection of ducks such as the dedicated Aqua Spa Supplies Duck to promote convenient 24/7 ordering service, as well as the Surf Duck, Life Guard Duck, Mermaid Ducks and Hula Duck. “We’ve now had the mezzanine floor installed at our Aqua Spa Supplies warehouse and this provides us with greater capacity to increase all of our various product stock levels for our customers this year and beyond,” reported John. “We’ve heavily increased our stock levels and have introduced some nice lines into our thriving accessories range as well. We’re constantly looking out for other products but we’re also concentrating on getting things right with our essential wet leisure products for our trade customers. This increased capacity is providing additional storage space of the newly-launched Aqua Step range that now complements the Aqua Lift cover lifters. 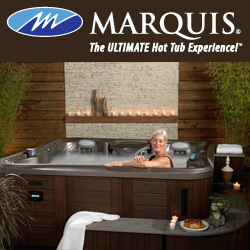 Both will be promoted once again during the Hot Tub Living Expo in October and then at the 21st edition of SPATEX. The former UK Pool & Spa Expo is returning to the Birmingham NEC as the newly renamed Hot Tub Living Expo for two full days, on October 24 and 25, following the introduction of a new Exclusive VIP Preview Evening on October 23 for a select group of companies and individuals to meet the 2016 exhibitors. John believes the new Aqua Step range will achieve the same popularity as the current range of Aqua Lift options. He revealed that the Aqua Step range has an option of a convenient storage unit within the steps to help owners to store away out of sight any cleaning products and accessories. “These are very rugged steps that we’ve introduced with our own dedicated ‘Aqua’ branding and packaging like we’ve done with the Aqua Lift options,” explained John.